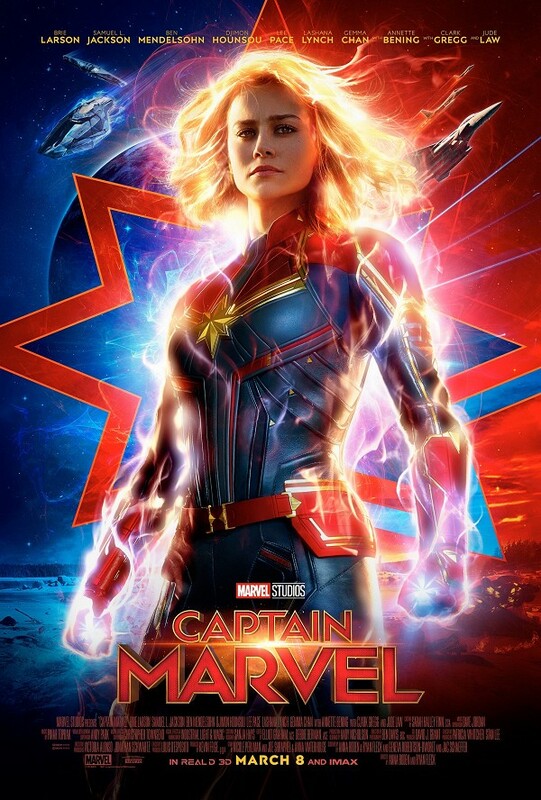 I really enjoyed "Captain Marvel" as did the rest of my movie-going crew. It starts with a montage of Stan Lee cameos replacing the opening Marvel credits. That set me off in a good mood. Watch for him again in a new cameo further in the film. Brie Larson does a good job as Vers/Carol Danvers/Captain Marvel. You meet her as a member in the army of the Kree fighting the Skrull. This is where you also meet Jude Law as Yon-Rogg, her mentor. Annette Benning is the Supreme Being who leads the Kree. All do a good job. Of course, Samuel L. Jackson is there as the volatile Nick Fury. He and Clark Gregg as Agent Coulson have to be digitally de-aged during the entire film as it takes place in the 1990s. You see how Captain Marvel evolves. At first, it may be a little confusing but not for long. The writing crew and the co-directors prominently feature women. This was nice. I believe it puts a slightly different spin on the story. After all, it was released on International Women's Day. All-in-all I really enjoyed it and I'm looking forward to this character's inclusion in the Avengers. Stay for the two post-movie, credits scenes.